Well, today I discovered one possible place: they learn it in school. My daughter is in the first grade of primary school (which in Australia is called ‘Prep’), and she is learning to read. Every night she brings home a reader, and she reads it to me or to her dad. Today’s reader was called Tammy Toodlepepper Paints the Town (by Tracey Reeder, 2000). The story in this book involves Tammy waking up and wondering what to do today. She decides to plant flowers, but in her garden she discovers ‘there was graffiti all over her gate’. So instead of gardening, Tammy paints over the graffiti. She paints purple and red flowers instead. I guess there are bits and pieces of ideology threaded through the majority of kids’ books: things to do with heteronormativity (the frog turned into a prince and married the princess), or with race (I can well recall growing up with Noddy books, and the later furore about the character of the Golliwog, who has since been excised from most modern Noddy stories). I hadn’t realised kids are also being taught that graffiti is always ‘a mess’ and must always be cleaned off or painted out. As with many bits and pieces of ideology, it’s depressing to see the poverty of imagination revealed in Tammy Toodlepepper Paints the Town. JR is a French photographer who used to paste up in the street the poster-sized printouts he had made of his photographs. Since he did this without the permission of the property owner on whose building he would stick the artwork, his art was, of course, illegal. 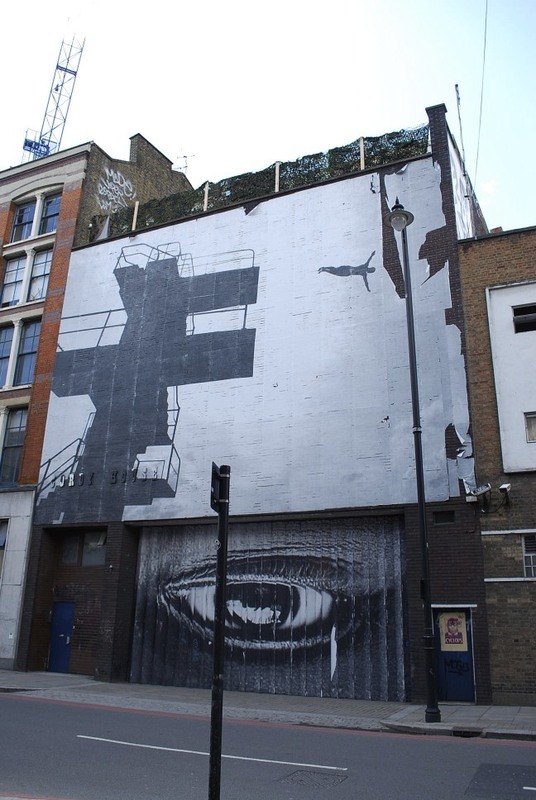 JR has become one of the most internationally celebrated ‘street’ artists (have a look at his website to get a sense of his fantastic work). He is one of the six artists who were selected to exhibit their work on the front of the Tate Modern in London earlier this year (see the blog entry in October, ‘Street art and the museum’). He has built this huge international reputation around a simple but clever artistic device. He makes portrait photos: head-and-shoulders shots, waist-upwards shots, extreme close-ups of faces or of facial features such as eyes. These photographs are then blown up. 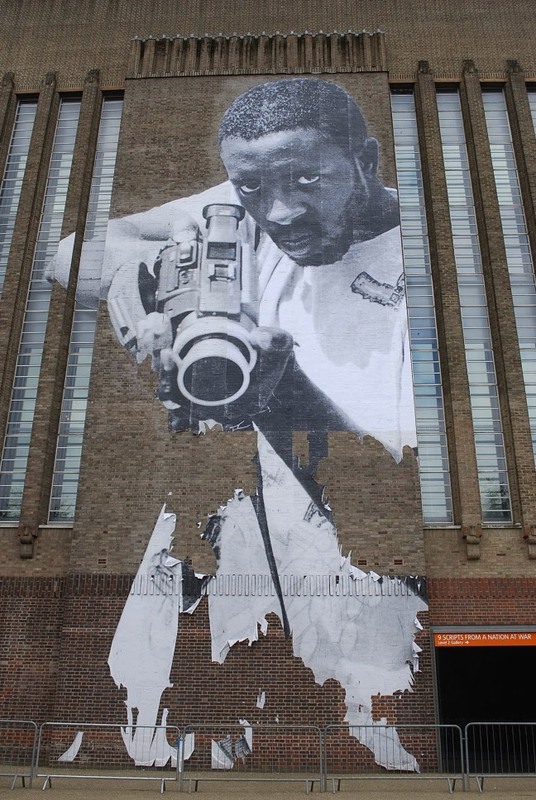 It’s through this simple device that JR has become famous – the photograph replicated and expanded in size, pasted up around the streets. These portraits were also made within the parameters of a political point of view. 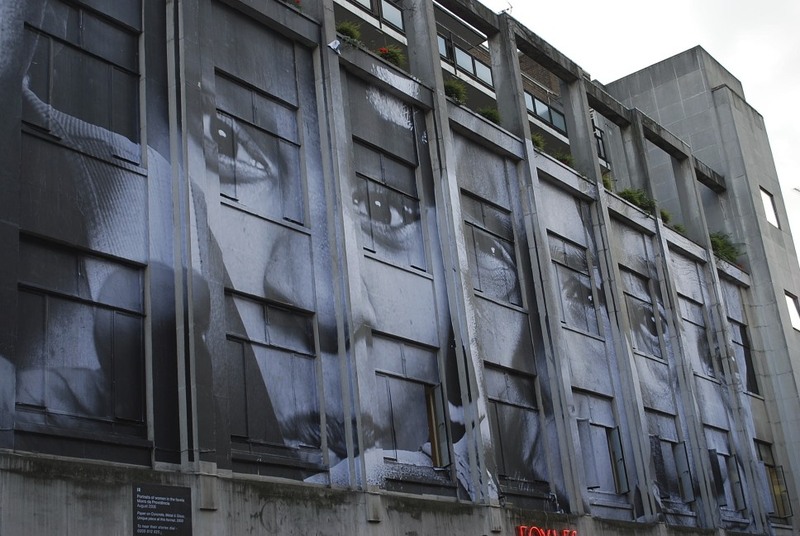 JR’s artworks draw the spectator’s attention to issues of race, ethnicity and poverty, all of which are crucial issues in a city such as Paris where JR began pasting up his work. 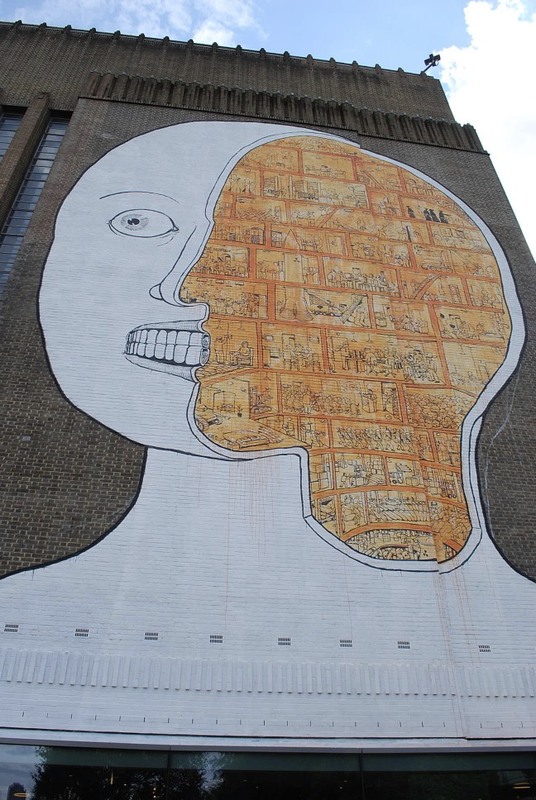 What you can see is an image that is several storeys tall, situated on a building in Old Street in Shoreditch. The massive buildings next to it become simply part of the artwork’s frame. There’s also something of the trompe l’oeuil about the image: it’s black and white, it’s clearly not real, its perspective is all wrong for it to work as a straightforward in situ illusion, but there is something about the image – deriving from its nature as a photograph – which means that the spectator looks into it as well as at it. It is as though two separate worlds have been made to rub up against each other. 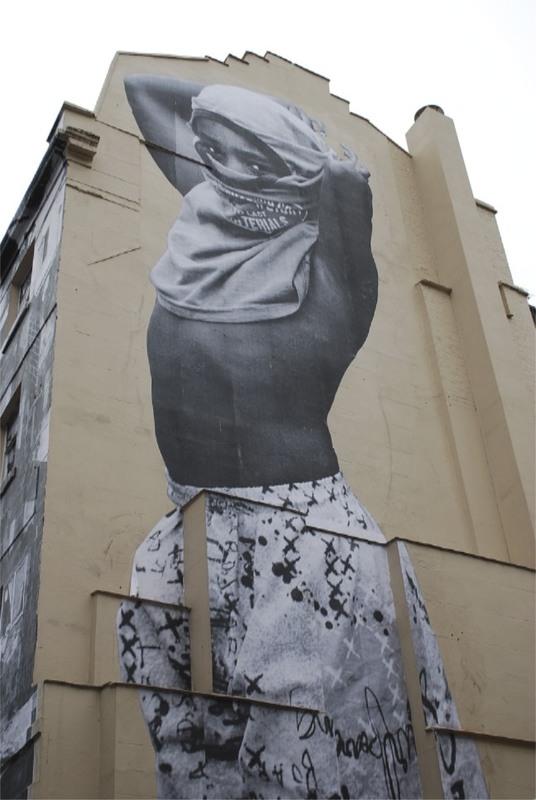 While in London in October, I saw JR’s show called 28 Millimetres: Women (it’s just a small part of his massive 28 Millimetres project much of which focuses on post-conflict societies in Africa, more details on JR’s website, and on this aspect of the project see this link). JR took photographs of some of the inhabitants of Morro da Providencia, a favela in Rio de Janeiro. As is his usual practice, he blew up the photographs and turned them into massive posters which he pasted onto the sides of walls and buildings in the favela. He also used some of these to make some more conventional ‘fine’ artworks, and others were blown up to the enormous sized images which covered some buildings in the street outside. In addition, he made a film in the favela, which features the artworks he made for the buildings but which is also very much an artwork in its own right. The show took place in the two Lazarides galleries (one in Greek Street, and the other on Charing Cross Road, both in Soho), and on Manette Street, a small street which runs between the two galleries (here’s a link to the Lazarides website and its information about the show). The Greek Street gallery contained the works which most conformed to the genre of the ‘fine’ artwork – that is, individual works, hung on the gallery walls. And on a screen at the rear of the Charing Cross Road gallery, showing on a continuous loop was a short film – for me, the most extraordinary work within this incredible, multi-layered show. The opening shows a news anchor relating a story about the shooting of some of the favela’s inhabitants, after the military opened fire on a public square. And this straightaway establishes the context for the film: the impact of militarised violence and torture inflicted upon a community. 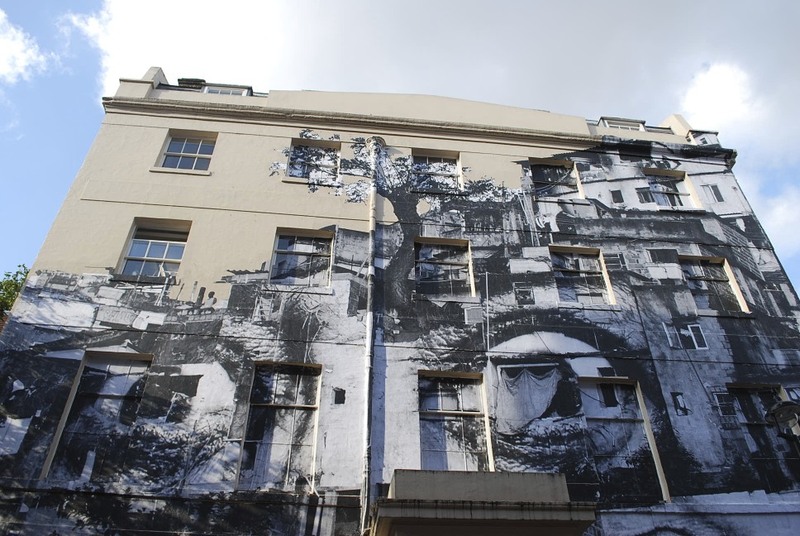 After this, the film shows, through time-lapse film, the installation of JR’s images throughout the favela, as they are pasted up on walls and outside houses. For this sequence, the camera is positioned quite a distance away and well below the favela, so that its entire upward sprawl can be seen, with the eyes, mouths, foreheads and faces of JR’s subjects now covering many of the vertical surfaces (there’s a still showing this on the Lazarides website). 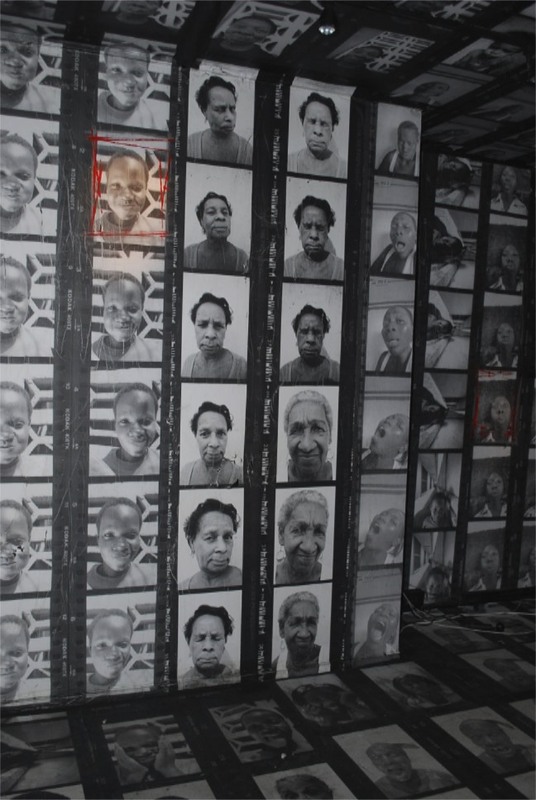 But the film’s purpose is not (or not only) to record the installation of these works. JR’s objective is always portraiture, but here he produces a portrait which is multi-faceted enough to do justice both to the many individuals who face the video camera for JR and to the identity and space of the favela itself as a community dealing with the aftermath of police violence. After the opening, the film is mainly composed of a series of sequences in which the camera races down alley ways and eventually halts in front of an individual – sometimes a woman, often a child, occasionally a man – or in which the camera follows someone through the interconnected rooms of their home, often ending up with that individual (child, woman or man) standing on the flat roof of their home with the favela rising and falling around them. But although I say the camera ‘halts, or someone ‘ends up’, these words aren’t an accurate description of what the camera is doing, because they imply that some kind of even momentary stasis is reached. Instead, the camera is in constant motion, its film speeded up so that it fairly tears through the streets and alleys. Even when it is apparently at rest and in contemplation of an individual face, it is still recording at an accelerated speed, so that every single blink, glance or expression registers as a twitchy jitter in the subject’s face. In this way, what could have been a languid, leisurely excursus through the favela is rendered urgent, compelling (and fitting the film’s attempt to show how trauma registers within the everyday life of the community and its inhabitants). And while the camera is building these jittery portraits of place and face, various voices speak (with sub-titled translations). At one point, a woman relates the experience of having to go to the garbage tip to search for pieces of her son’s body, after he had been taken away by soldiers and then killed. Her voice says: ‘it hurts your soul’. Another says: ‘I only give this interview because you are not from here and will take it far away, otherwise I wouldn’t, for I am afraid of the violence’. One boy narrates his witnessing the shooting of three children when the police started firing upon a demonstration in the public square. And another woman speaks of how Providencia had been neglected by artists, and how important JR’s intervention is for the community. She calls it ‘the power of vision’. Many of the faces which constitute as the film’s jittery portraits are solemn, sombre or impassive. Occasionally a smiling face is shown – a young woman breastfeeding her baby, a little girl laughing. Many of the voices speak of how much they love Providencia, of how grateful they feel to have lived there. Such love, such gratitude, in the context of lives lived amid violence and loss, is amazing. The film completely succeeds in conveying the tension between a sense of the beautiful (the favela as a space of community and happiness) and the experience of violence (the faces whose camera-accelerated jitters seem to bespeak the pain they have undoubtedly suffered, and the favela as a site of loss). And as such it is a text profoundly about trauma, about the inability to resolve such a contradiction. It is about witnessing violence, and about making art visible. It is about seeing the effects of violence, and about creating an artwork whose faces and eyes look outwards from the hillside towards the city whose police force has inflicted such harm. 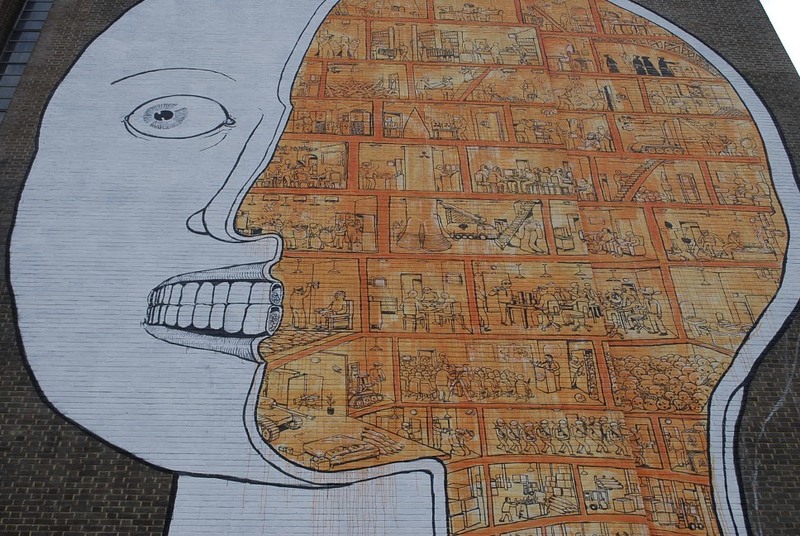 Through art, the houses are literally made to look, as walls and windows become eyes, faces, bodies. The film ends as night falls over Rio de Janeiro, and these faces, bodies and eyes fade into black, with the camera juddering the distant lights of Rio into a neon blur. Freeze frame, and then black. The film ends, but there is no ‘end’ to what we have seen. ‘All in the moment’ – revisited and illustrated! Sometimes you are in the right place at the right time, as they say – and for me, this happened one night back in October when I happened to see a guy putting up a sticker in a London Underground carriage. You may recall my delight at this right-place-right-time happening from the previous entry on this blog, ‘All in the moment’. Sometimes you are in the right place at the right time, but without a camera. That night I had been at the theatre with a friend, and I hadn’t taken my camera with me. I sat on the train watching this guy calmly and smoothly attach the sticker to the wall and I was unable to photograph the result. Argh! 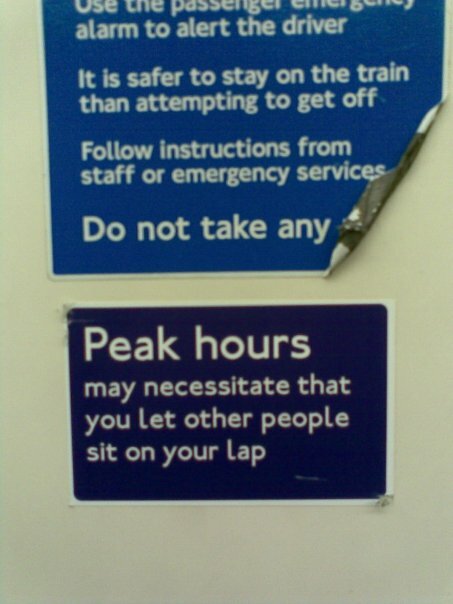 In the blog post, I wrote about imagining someone catching sight of the sticker on a busy train, and smiling because of it. Well, not only did that indeed take place, but the person also happened to have a camera with them and take a photograph of the sticker. You can see in the photograph that the sticker is just starting to fray and peel a tiny bit (though not as much as the ‘official’ sticker above it). And let’s just admire what a great piece of work it is: the font, the layout, the wording, the white border, the shape and size. I wish I knew who this guy was. When I saw him put it up, I didn’t speak to him, because I somehow didn’t want to interrupt his performance: I didn’t want to be ‘the academic’, saying ‘excuse me, do you mind if I ask you why you are doing this and how long you have been doing it?’. Sometimes you just want to be the audience – admiring, appreciating, and enjoying. The consequence of that is of course that I may never know who he is or how many stickers he has put up on the Underground or elsewhere around London (imagine it! maybe he makes these ‘almost official’ stickers for loads of different sites – what a fantastic idea). But not knowing is somehow OK – I love the idea of this anonymous person carrying out this small act which beautifully resists what Nadia describes as ‘hyper-individualised and negative Tube culture’. Thanks again for the photo, Nadia. Sometimes it almost felt like I had imagined the sticker, and it is so good to see it again. 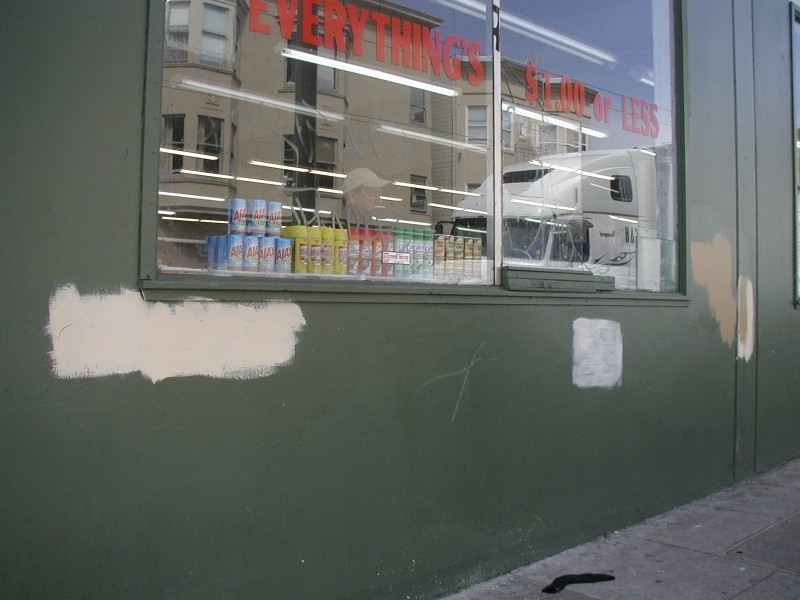 Different cities, just as they have distinctive cultures of street art or graffiti, have different policies for removal of illicit images from urban spaces, and different methods of removing (buffing) graffiti and street art. Some councils employ cleaning crews who use water sprays, other paint over images. Graffiti removal is also big business – in Melbourne, there are many graffiti removal companies, such as Graffiti Eaters. 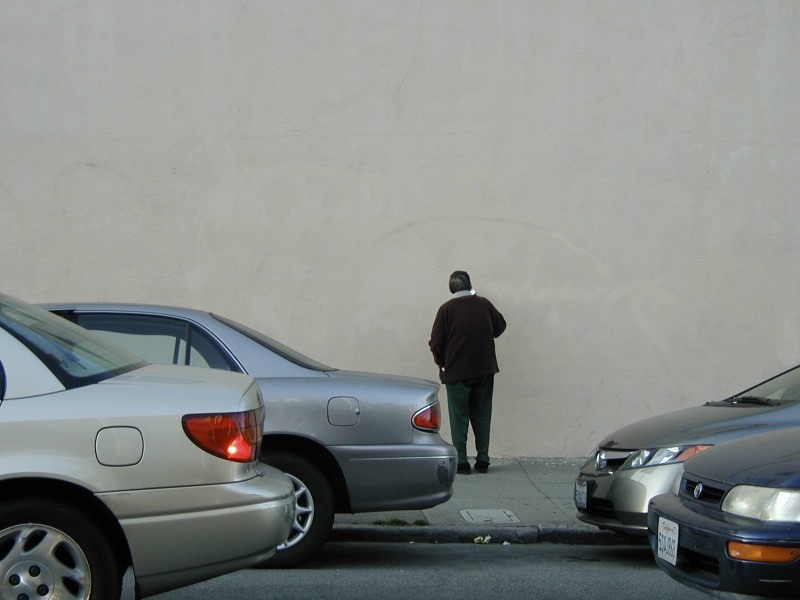 Sometimes ‘concerned citizens’ get involved – Neighbourhood Watch groups, or organizations such as Graffiti Hurts Australia, or R.A.G.E. (Residents Against Graffiti Everywhere), or even individuals (such as ‘Guerilla Joe’, in Doug Pray’s fantastic documentary film Infamy). Blank walls were what I found in many streets of London recently. 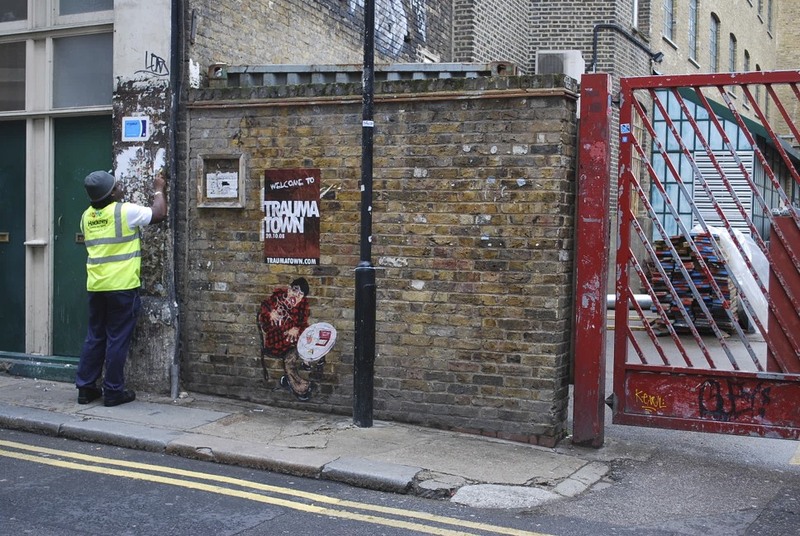 In streets where, in July, there had been a lively ‘conversation’ (to use Russell Howze’s term – thanks, Russell) of stickers, tags, stencils, objects, paste-ups, by October many of them had been cleaned up, all over Shoreditch, and up and down Brick Lane. 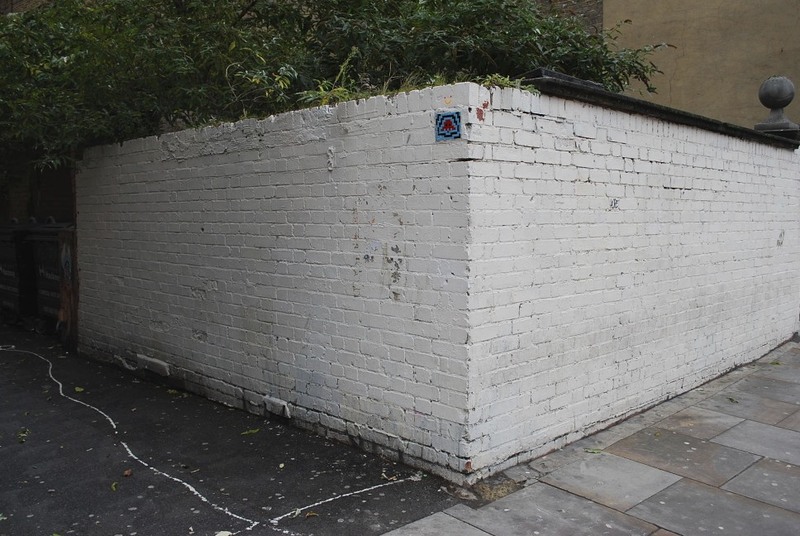 Turns out that the local councils (London Borough of Hackney and London Borough of Tower Hamlets) had decided it was time for a cleaning blitz, with the result that hundreds of images had been buffed. The film is about the hunger strikes organised by the IRA in the Maze prison in Belfast in 1981. Many IRA members in the prison took part in a series of protests, in an attempt to compel Thatcher’s government to recognise the political nature of IRA activities. The British government refused to do so. The prisoners, for many years, refused to wash and to wear prison uniform. The prison authorities gave them each a single blanket, rarely cleaned their cells or their bodies, beat them and tortured them. Unlike the scandals at Abu Ghraib, which led to the trials of several soldiers, as far as I’m aware no member of the Maze prison authorities ever stood trial for what was carried out there. And after the ‘no-wash’ and the ‘blanket’ protests had seen no success, a hunger strike was begun. Bobby Sands was the first to go on hunger strike; a further prisoner began a hunger strike every fortnight after the commencement of the protest. Sands was the first to die; a further nine prisoners died too. These hunger strikes were a huge part of my early years at university. The newspapers were filled with stories about the hunger strikers; Bobby Sands was elected as an MP during his hunger strike; he also was elected President of the Student Union at Glasgow University (I grew up and lived in the West of Scotland, an area filled with strongly sectarian sentiment). Seeing Hunger today brought back many memories from that period, and it’s amazing to me that so little is now talked about the Maze hunger strikes, and the ‘dirty’ protest, and the abuse that was perpetrated within the prison walls. The film is very difficult to watch, in that it unsparingly shows Sands’s physical decline as he starves to death. But the film-making demands that we watch. I simply want to mention the first few scenes, which show a man getting dressed in his bedroom, washing his hands, and then going downstairs to eat a plate of food prepared for him by his wife. There’s no dialogue or music in these scenes. We don’t know who this man is (later, we learn that he is a prison officer). But what is so beautifully rendered is the simplicity of these everyday activities – dressing, washing, eating – activities which have been, as the film is later to reveal, rendered absolutely impossible for the IRA prisoners (who must live in faeces-smeared cells, with maggot-infested piles of rotting food on the cell floor, naked except for a blanket, filthy and unable to wash). These scenes take only a few brief minutes at the film’s outset, and they would be easy to miss. If you see the film – and I recommend you do – take note of these scenes, and the activities they show. They’re easy to overlook, we do them everyday. How luxurious are our lives that we are able to do them without giving them a second thought. How great is Steve McQueen’s film in that it shows what life can become when that freedom (to wash, to eat, to wear our clothes) is taken away. 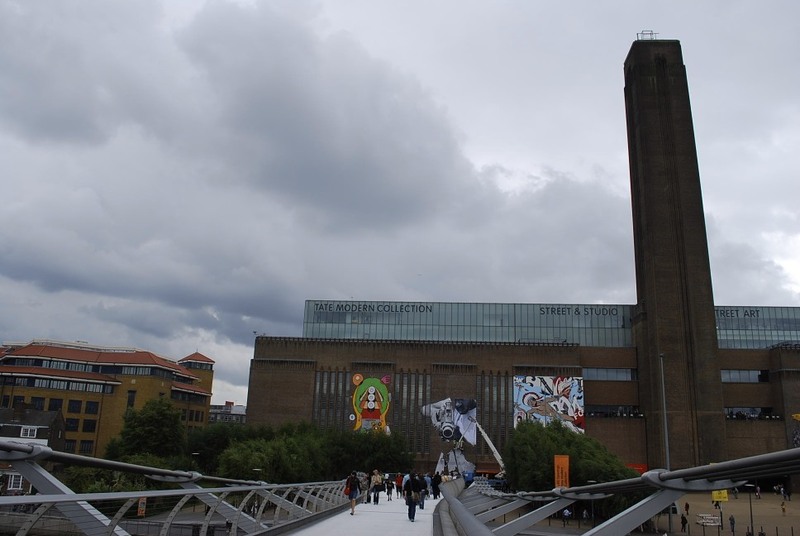 In the northern summer of 2008, from 23 May to 25 August, the Tate Modern art gallery in London hosted an exhibition called Street Art, curated by Cedar Lewisohn. The exhibition involved the installation of works by six artists on the front façade of the museum, plus film screenings, a program of talks, a walking tour around the area showcasing works in the street (a further five artists were commissioned to create works especially for the designated sites), and a Street Art Information Tunnel in the museum forecourt, showing short films, providing information, and with a tagging wall (textas and marker pens provided). There’s information about the exhibition and the artists in the Tate’s archive here. 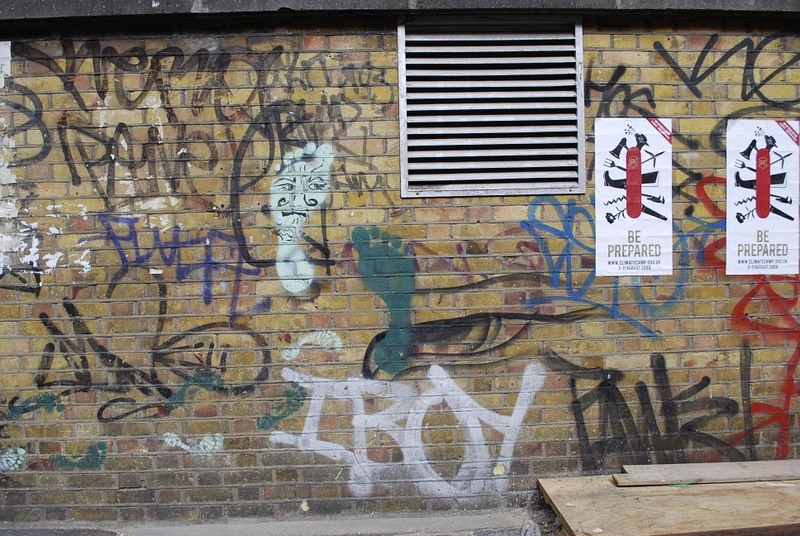 Lewisohn also produced a book on street art, which constitutes an extremely interesting account, contextualising street art in a broader way than many other commentators – see here for more details of the book. 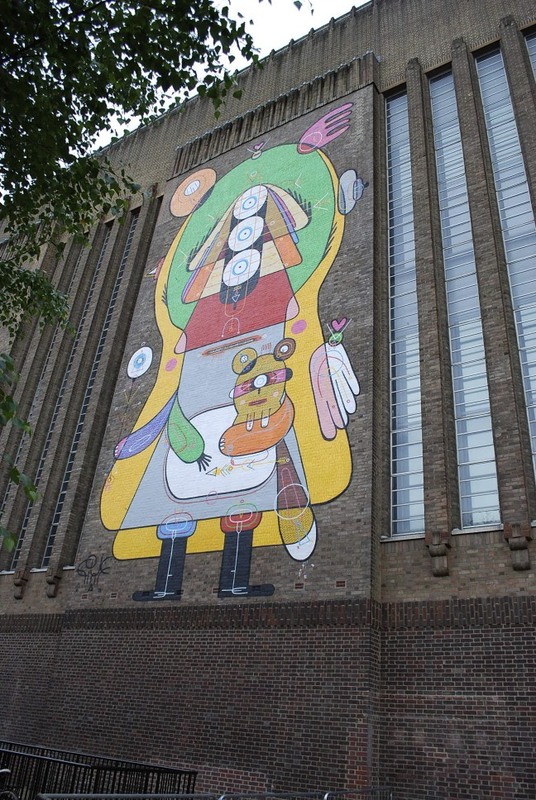 The artists who were selected to exhibit on the Tate’s massive outer wall were: os gemeos (Brazil), Blu (Italy), Faile (the United States), Nunca (Brazil), JR (France), and Sixeart (Spain). The artists who exhibited works for the walking tour were 3TTMan, Spok, Nano 4814, El Tono and Nurla. Once in the museum forecourt, visitors gazed upwards at the outer wall, able to see the detail in each work – especially interesting in the case of the image by Blu. In this first picture, you can see the work as a whole; the second one shows the amazing detail. Proximity to each image of course changed the perspective on it: standing beneath each one, the spectator was towered over by each image. 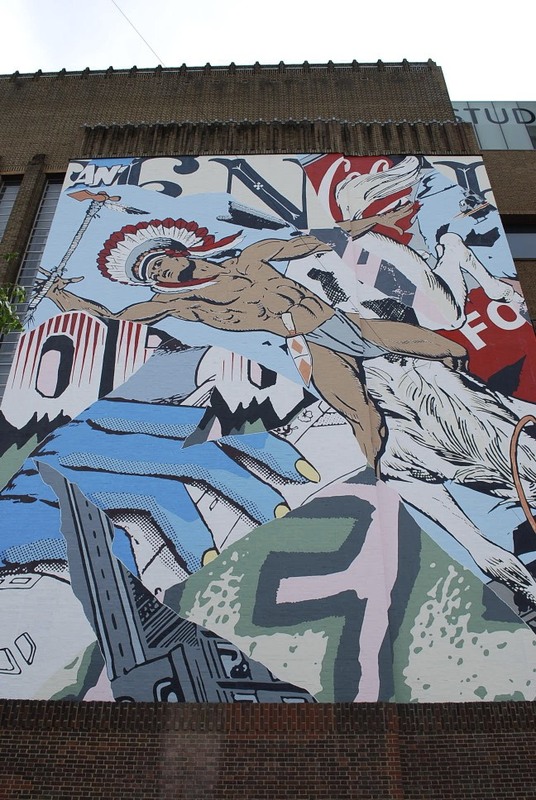 Some, like this Faile piece below, were enormously powerful and dominating in appearance. It can’t be denied that it was amazing to see such works, and to see them on the wall of as august an institution as the Tate Modern. But I have just a couple of misgivings about the experience…. First of all, the scale of the images. The sheer size of these works (as you can see, they were of course done with the assistance of cherry pickers and so on) almost takes them out of the domain of street art and puts them into the realm of something else. The work is, literally, elevated – raised up off the street, placed high on the façade of the museum. Looking at these huge, amazing works raises the question, ‘what is “street” about ‘street art”?’ Is it work done on the street? If so, then these works would obviously be excluded from that definition. Is it work done with a particular sensibility on the part of the artist? Is it work with a particular ‘look’ to it, a specific aesthetic? Is it some combination of these? 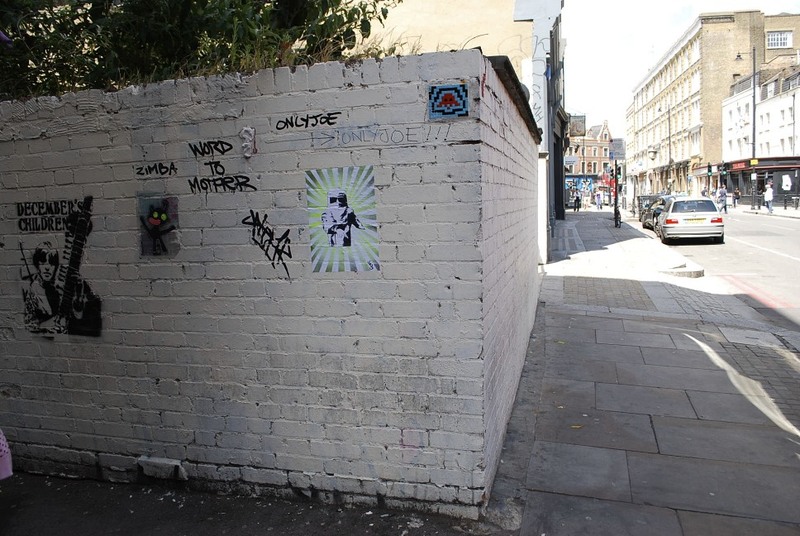 Although all six of the works had the requisite sensibility (all of the artists are well known for their previous work on the streets, legal and illegal), and although all of the works variously participated in the aesthetic that seems to characterise street art (an engagement with pop culture, contemporary politics, an awareness of spatiality, a willingness to manipulate image and genre), it’s also worth considering what happens when ‘street’ art meets the museum. The debate around the tensions between art that is made for the streets and then exhibited in gallery space is well-rehearsed. But I think that those tensions are multiplied when artworks that are at least in some way related to the space of the streets are then brought into the realm of the museum. Small galleries (which is where the majority of street artists exhibit their work, if they exhibit at all) really are, oftentimes, small. Of course, they are driven by lots of imperatives, some of them commercial, some of them about cementing a particular reputation for themselves within the gallery scene. But they are less often trying to make a statement about capturing the artistic zeitgeist, or cataloguing artistic worth, or building representative collections. Museums, on the other hand, are driven by exactly those objectives. That’s one of the reasons why the National Gallery of Australia’s purchase of prints of stencil art by street artists had such political and cultural significance – as a museum, the NGA’s interest in street art lends a kind of institutional validation to street art and the artists (something that is important to remember when governments attempt to pour scorn on the cultural value of street art, as has recently been happening in Melbourne). 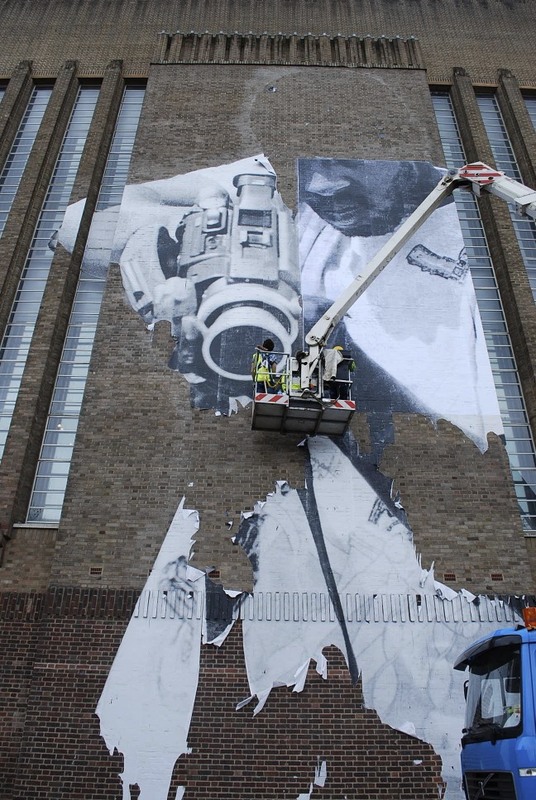 So what cultural value is generated by the interest of the Tate Modern in street art? Well, of course, you could say it recognises something that has become hugely important in many British cities (especially London) and something which has become of particular cultural importance to young people. You could say that Lewisohn’s assembling of these particular works demonstrates an outward-looking worldview that see beyond any limited self-image of London as the global centre of street art (in his selection of six non-British artists for the exhibition). All of these things would be correct. 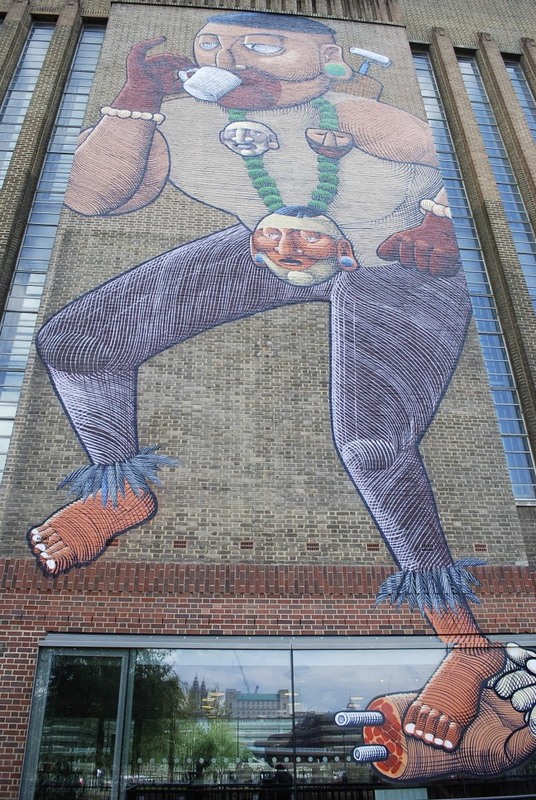 But there’s something else worth thinking about, in this consideration of the cultural value of the Tate’s street art exhibition, and in the encounter between street art and museum space. 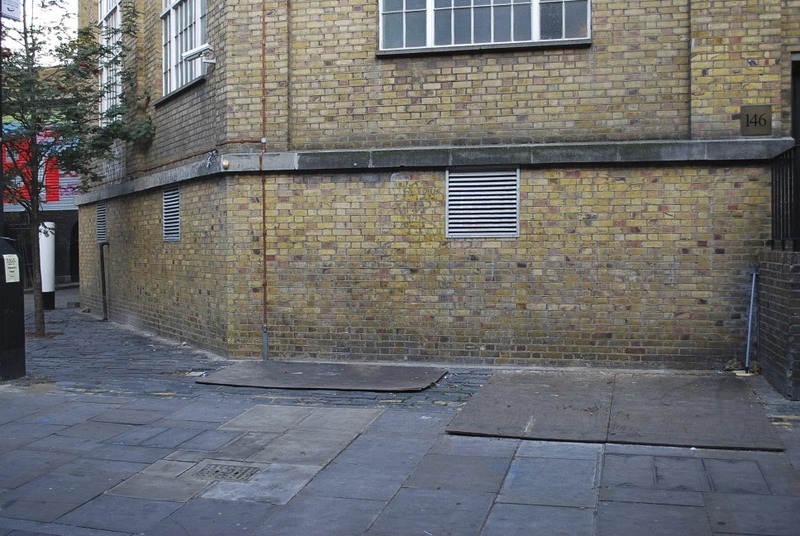 When I first heard that the Tate was putting on an exhibition about street art, I emailed the museum for information, and in their response, I found it very interesting that they said: ‘there is no work in the building, only on the front and in the area’. This comment was made as part of a helpful and detailed email from the Information Department, and I initially didn’t give it much thought. But after going to the Tate and looking at the façade, and doing the walking tour, and visiting the ‘Information Tunnel’, I was struck by the fact that the ‘street art’ stayed outside the museum. And then struck again, weeks later, when I heard that the works on the outer wall had been removed when the exhibition ended in August. Since no works made it inside the museum as part of the exhibition, and since the outside has now been returned to its ‘normal’ appearance, there’s little evidence that the Tate ever had an exhibition showcasing street art (except for the items for sale in the gift shop). And that seems – well, ‘wrong’ is too strong a word for it. But think about it: if the Tate Modern bought an artwork by Warhol or by Rothko and then, after a few months, destroyed it… wouldn’t that seem strange? Those works by Blu, Faile, os gemeos and the others were fantastic and wonderful, and are now gone. That the museum played a part in their disappearance somehow feels disappointing to me.